A friend of mine, who was a jewellery maker and silversmith, decided she needed to brush up on her hand drawing technique and bought a book called Drawing on the right Side of the Brain. As I remember (this is a while back) the book used exercises like “‘upside down drawing’, ‘blind contour’ and ‘modified contour’ drawing. A whole chapter is devoted to negative space drawing”. It approached drawing in a way that was diametrically opposed to my then idea of a technique that started mostly with outlines. That’s as close a simile as I can find to describe Tracy Crisp’s writing. In the Ozblogosphere, we know Tracy as Thirdcat. 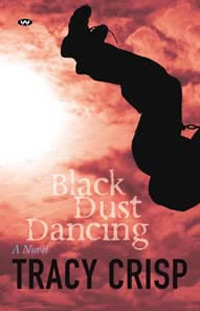 Black Dust Dancing is Tracy Crisp’s first novel. It’s set in a provincial town dominated by a lead smelter, a blokey setting but the women in the novel are kept firmly front and centre. Oh, and I’d like to know – as the mother of two primary school-aged boys, how does Tracy get the voice and manner of a teenage girl so exactly? It’s uncanny. I have clear visual images of Suzie the hairdresser, and Vicki the doctor’s receptionist, and Libby the mother-in-law, which I have not because Tracy wastes words in drawn-out descriptions, but because I have a sense of the sort of people they are, and then just a few words are enough to flesh out their physical realisation. Piece by piece: if you’ve read Tracy’s blogopera, Adelaide Sprawls, you’ve experienced the way she builds a world this way. I loved Adelaide Sprawls, and it frustrated the hell out of me, because the vignettes were like pieces of a vast jigsaw that’s only just begun, with a smattering of pieces in the centre and one or two out on each side, with no bigger picture visible. I was eager to get my hands on Black Dust Dancing but I wondered whether I’d love it or chuck it across the room, unable to understand What in Hell Is Going On. Well, reader, you’ll have a pretty good idea what goes on in this novel, but you need to pay attention. It has the courage of its convictions, but it’s not going to yell at you. There are some story strands that are murkier than others, and there is a point where things do get murkier and more obscure, then tail off. Like real life. Black Dust Dancing is a story you’re shown, not told, as Deborah says, by the little actions and pauses- the negative space- of everyday life. Jokes, complaints, gestures, eavesdropped gossip and asides. It seems to deal in little things, but out of these little things, big things grow. I’m halfway through her book and every moment and nuance she describes – like, say, a trip to the hairdresser – is brilliant. And to think that all I can write about with such depth is farting….! So true! That’s one of the things I very much like about it. That and the way she builds characters and situations out of little things, as you say. Very nice review indeed, Helen. …and I forgot to say that my art teacher in year 10 used ‘Drawing on the Right Side of the Brain’ and it was a real revelation for me (seriously). I even found my own copy of the book about twenty years later! Dr Cat has written a bit about the book too: Still Life with Cat: In which Third Cat’s book is launched. I like your review, Helen, especially pointing out that what’s not said matters a great deal.